I like to ride my hybrid bike around the bay and then on the coast. Portland is perfect for it. 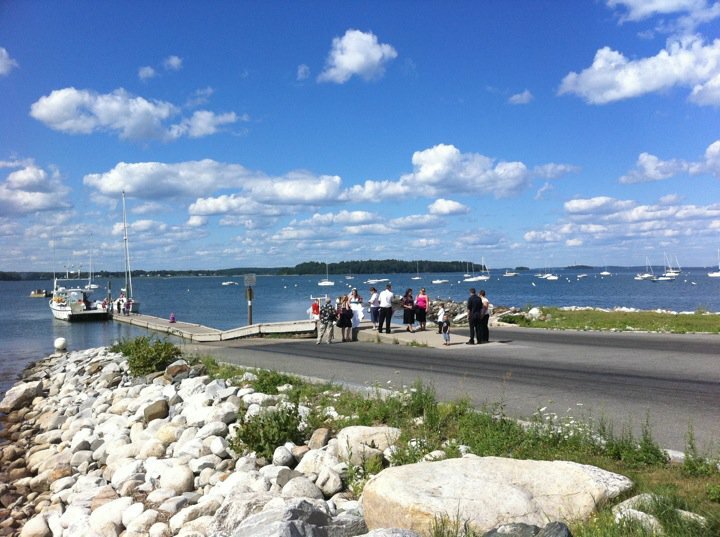 There are sailboats, lobster boats, ships and awesome trails for walkers, runners and bikers. Yesterday I even saw a bridal party on a dock. Beautiful! But then, there she is. It’s the dreaded middle walker. She can’t commit to one side of the path or the other. She’s in the middle with arms flailing on her power walk. She can’t hear me because her earbuds are buried deep in her skull. My stress level goes up. If I go to the left she might get spooked when I hit her peripheral vision and she’ll jump into my way. Right? Same concern. She bugs me more than a dog walker taking up the whole path. At least with him I know I have to put on the brakes and wait until he sees me. She bugs me more than the new-mommy-stroller-brigade taking up the whole path and talking a mile a minute. They’ve got an excuse. They have to talk to other adults or start drooling themselves. They give me a look letting me know they own the path and I have no choice but wait until it widens. Most people ride, walk or run the path on the right. It’s America. We pass each other on the left with a friendly “comin’ on your left” greeting as part of an exercise brotherhood. It works. But Middle-walker? She just confuses me because I don’t know which way to go or if I should go at all. She stresses me out. Come to think of it, I wonder if that’s why non-church people get stressed out by church people. They call them hypocrites because they claim their religion is important to them but they don’t live like it is. They’re middle-walkers. It would just be a heck of a lot less confusing if they just committed to a side. Middle-walkers miss the big picture. They seemed so interested in reading and talking about what God was doing, missed it. How could they miss it? Because instead of trusting God, they took over. They were absorbed in what they themselves were doing. They were so absorbed in their”God projects”that they didn’t notice God right in front of them, like a huge rock in the middle of the road. And so they stumbled into him and went sprawling. We gotta stop walking in the middle. We gotta start following Jesus and stepping where He steps. This entry was posted in Christianity, Jesus, love, religion. Bookmark the permalink.